Trying to find your own style? 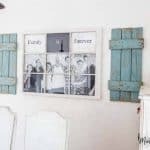 These 13 DIY rustic home decor projects will give you tons of inspiration, creative AND unique ideas on a budget! There’s just something about using wood in my home decor that makes me feel settled and comfortable. Imperfections are celebrated and the uniqueness of each individual board can be treasured and appreciated. I relate to the twists and turns of the wood, the way the rustic boards can’t be squeezed into a mold but need to be coerced and finessed to fit each individual accent piece. I’m like that as an individual and maybe you are, too. None of us are. Time marches on regardless of self help books and magic wrinkle creams. 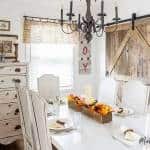 But there’s beauty in creases just like those pieces of wood my hubby and I have used to transform our home from messy kid zone to shabby chic rustic farmhouse with a hint of industrial thrown in. 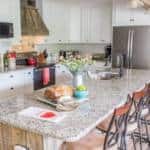 I’ve never lived in a brand new home and imagine I never will but the journey to discovering my own personal home decorating preferences definitely began with a love affair with wood. 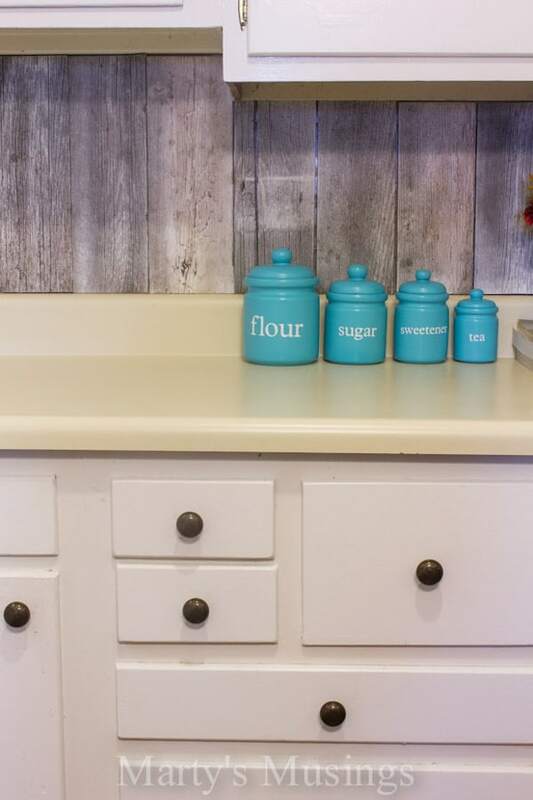 Today I thought it would be fun to round up 13 of my favorite DIY rustic home decor projects. 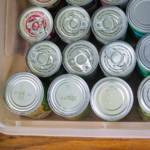 You might just find inspiration for a creative weekend undertaking! 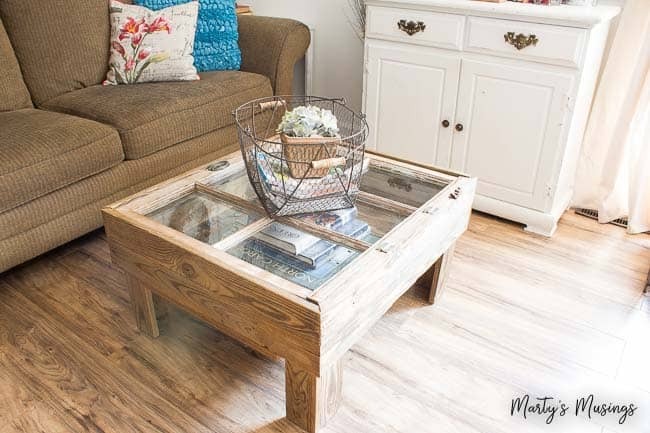 The very first DIY project I shared on this little blog journal I call Marty’s Musings was a table I talked my hubby into making from an old window. I still love it today! 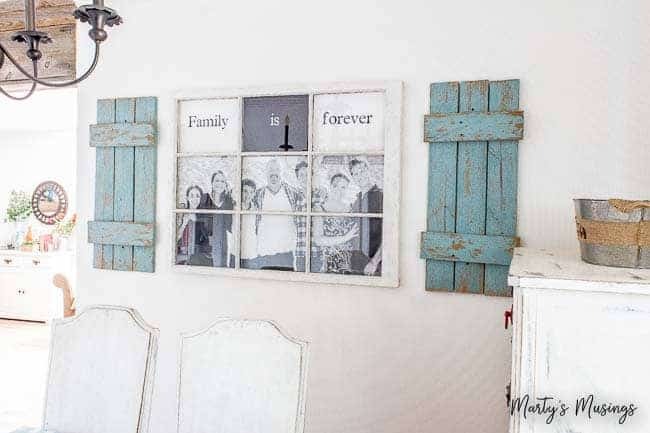 Because you can’t have enough old windows in your home we also made this unique photo frame to capture our family memories while keeping less stuff! 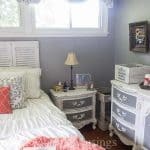 The distressed shutters were an added bonus gift from the hubby. I’m gonna admit it right now. We have a love affair with fence boards. Sometimes the neighbors give them to us and sometimes we find them on the side of the road. 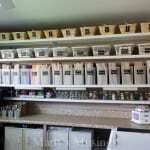 Either way, we age them and Tim makes them beautiful, like the cabinet that anchors our small bathroom. We needed quite a bit of that fence board to create a unique, inexpensive backsplash for our kitchen. (Yes, this was before we took down a wall and gutted the entire room.) This would be a great look for a beach house or mountain getaway, don’t you think? The very first room I shared on the blog was our den with this red sectional sofa. Can you tell my style has changed a bit since then? Yikes! I still love bright colors but I’ve toned down this room with more neutral colors in the last four years. One of these days I’ll show you what I’ve done! Until then, enjoy another table made by my creative DIY husband! What? ANOTHER fence board project? Yep. 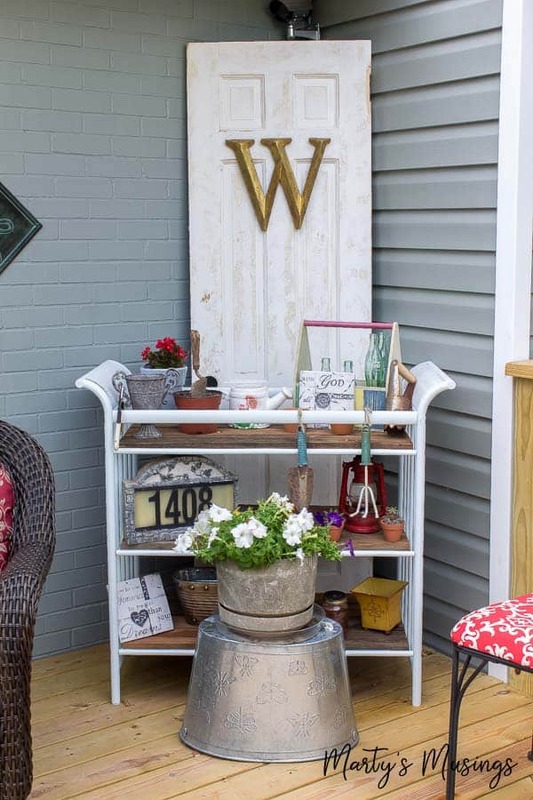 Can you believe this cute garden cart was once a changing table? With a few added fence posts it now sits on my front deck welcoming friends and neighbors. Can you spy a scrap wood project hanging on the wall? 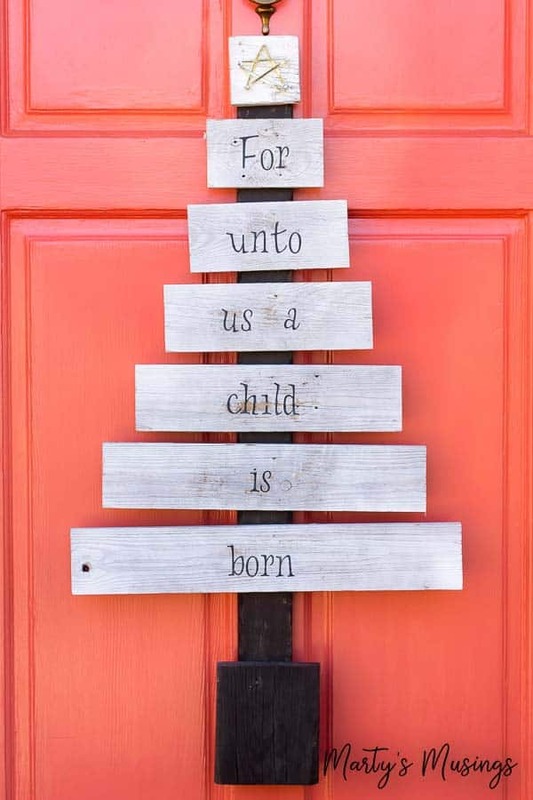 This sign was originally created for Christmas but now hangs in my kitchen as a permanent reminder to seek joy in all the everyday treasures of our lives. Now on to a few seasonal projects with…….you guessed it! More fence boards! 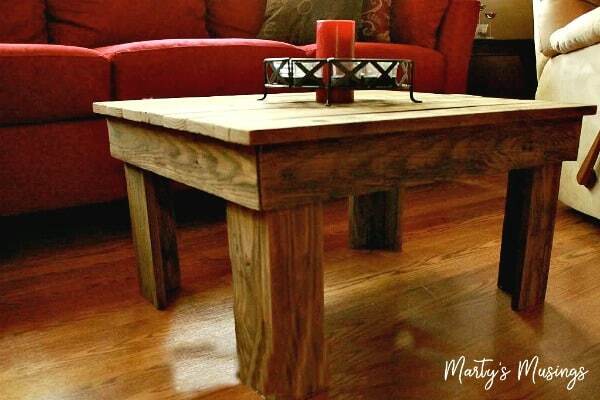 Repurposing wood for creative rustic home decor projects is one of the ways Tim and I enjoy spending time together. Nah, who am I kidding? We drive each other crazy most of the time! I have a vision of what I want and he’s usually charged with bringing it to life. Not always an easy task but he does a great job! We may not be Joanna and Chip Gaines but we do OK. I still hang or set out our scrap wood Christmas tree every year as it’s still one of my favorites. 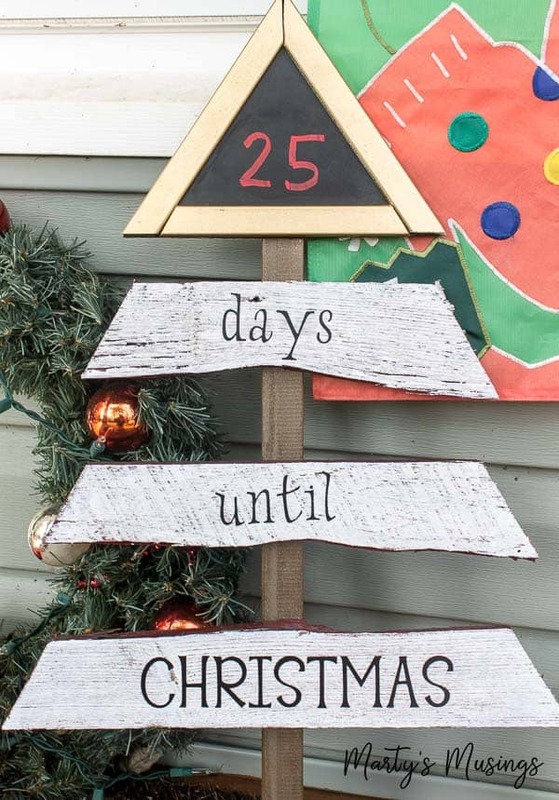 A little bit of regular and chalkboard paint, a bit of distressing and this Christmas tree is ready to countdown the days before the big day. It’s a perfect project to keep the kids reassured that the big day is indeed coming soon! 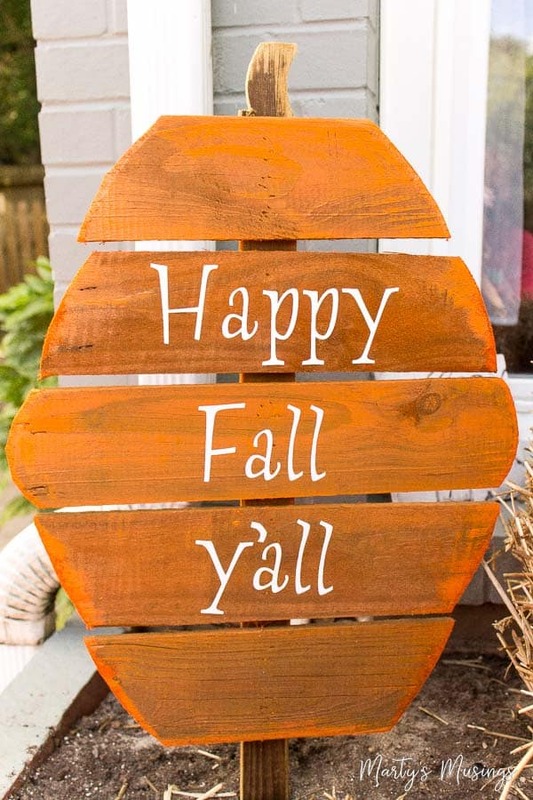 Even before we built our front deck I loved decorating right outside my front door, especially when “Happy Fall Y’all!” was the sentiment that greeted me with the return of cooler weather each year. 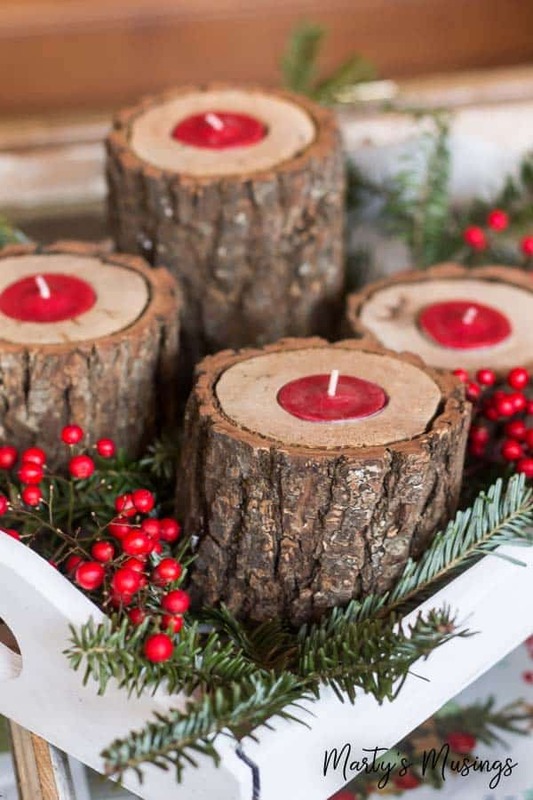 These wooden candles holders are a bit simpler but one of my reader favorites. You can also interchange candle colors and use it year round for a tasteful rustic touch. 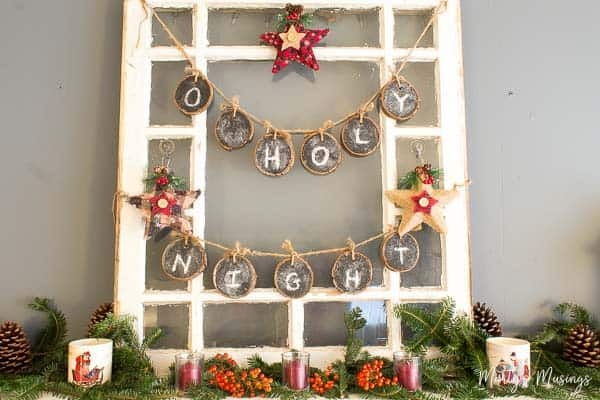 Made out of the same type of wood, I originally used this chalkboard banner with my Christmas village but last year I decided to hang it on an old window on my thrifty Christmas mantel. 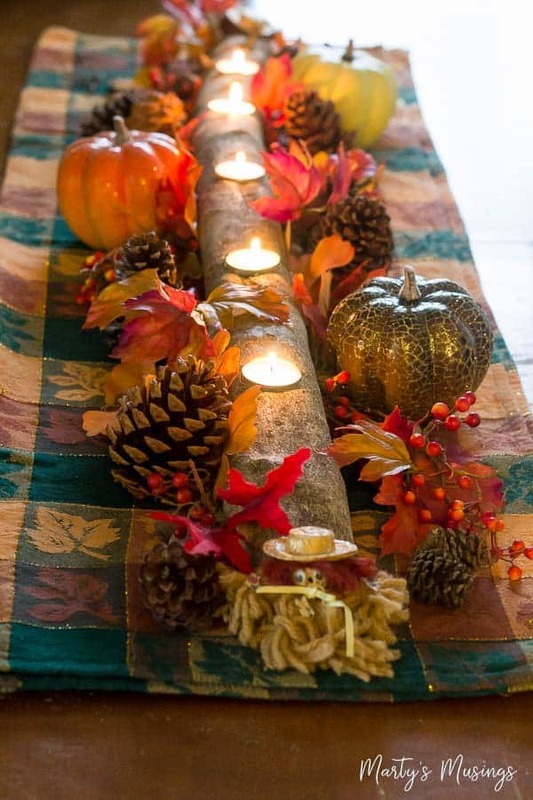 Last, but not least, this log is perfect for a centerpiece for any season but I decorated with a bit of natural and faux goodies for fall. Don’t you just love the richness of the colors? Whew! 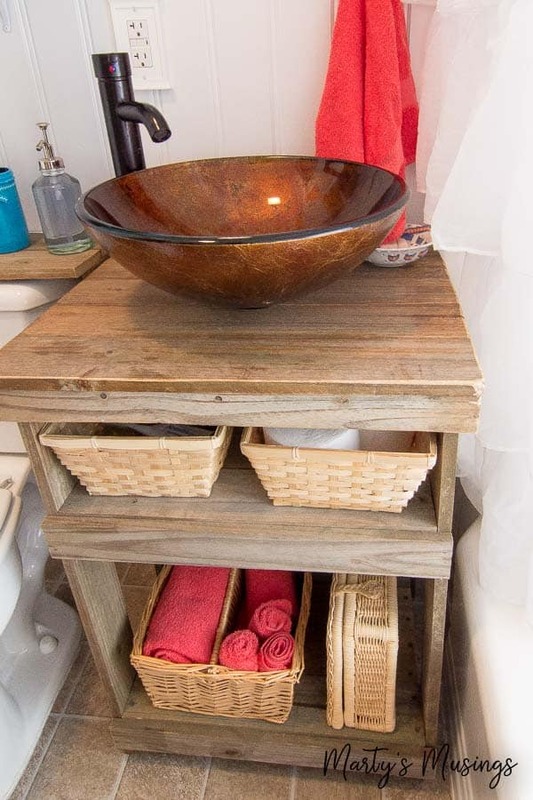 That’s a lot of rustic, DIY goodness right there! I’ll bet you probably found one or two ideas you want to save for later. 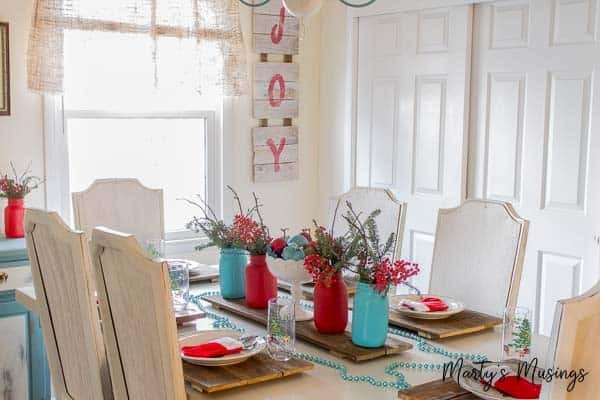 Go ahead and pin these 13 DIY rustic home decor projects now so you don’t forget! 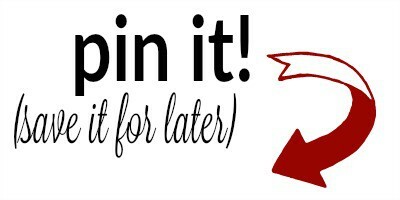 Love to see this post, I love your blog! It’s always been one of my favorites ? Love this post! We are always looking for farmhouse decor inspiration for our store!